Each fall, Basque cider makers start filling enormous wooden vessels full of fresh apple juice. As in England and France, traditional cider making is all-natural: the apples are ground and pressed, and nature takes its course. 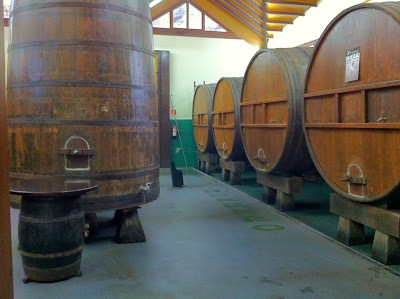 The difference, of course, is that the cider that begins pouring out of these vessels in January is sharp and acidic. Donostia is the population center--the Spanish name, San Sbastian, is often defaced on street signs--but the capital of cider is ten minutes south in Astigarraga. It's a town of 5,000, but the hills are covered with apple trees, supplying perhaps a dozen or more local cideries (it depends on where you draw the line). In the small area of Gipuzkoa, there are over fifty. The menu for txotx season has been fixed since the 1960s. Before that, when this region was almost completely rural, the locals would bring their own food. Now, they come only with an appetite. The first course is an omelette made with cod and rustic bread. Traditionally, there weren't even chairs--people stood around tables. But at some places, like Isastegi, they still don't use plates. It's family style--you just grab a crust of bread and your fork and dive in. The next course is cod, either prepared in a famous sauce called pil-pil or served with green pepper and garlic. The main course is a huge hunk of beefsteak barbecued bloody rare. 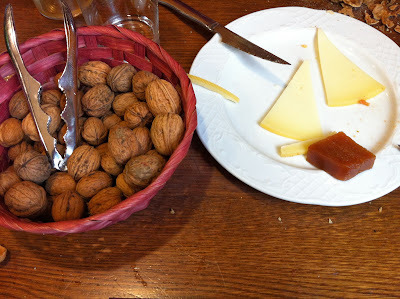 Finally, dessert is cheese and walnuts with an apple or quince paste. In some cases, it seems like the feast begins with a sausage course--because, presumably, the other four might otherwise leave you feeling peckish. Cider is meant to accompany food. In every restaurant we visited, it was always available, and about 60% of the time people chose it over local Rioja wine. Basque cuisine is hearty and salty. 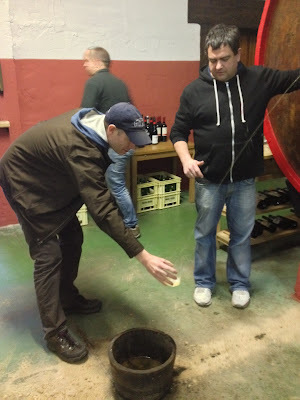 To my palate, it's the salt that harmonizes with the sharp Basque cider. Salt somewha neutralizes the acidity, and more subtle fruit and tannin notes emerge. Not everyone agrees it's the salt, though--at Isastegi they believe it's the "protein" (umami?) that draws out cider's flavors. 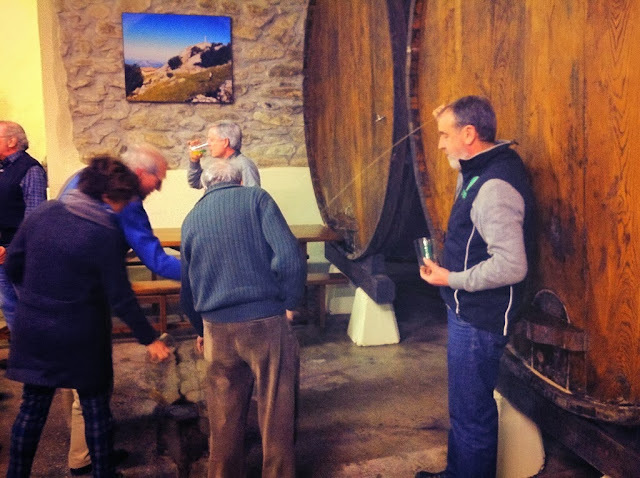 Whatever it is, the Basque food definitely serves cider well. I would go almost so far as saying you need to salty food to fully appreciate Basque cider. Probably not, but I would certainly encourage the pairing just in case. If you do find yourself in what the Basques call Euskadi (Basque Country) between mid-January and Easter, txotx is a must-see event. Sarasola sees 20,000 people come through their doors for it, and more-remote Isastegi 6,000. Attendees are mostly locals (many of whom go back and back), and it feels like you're witnessing a very particular bit of Basque culture. It's not really a tourist event, though tourists are welcomed with broad smiles. Don't expect to hear anything but the rat-a-tat fire of Basque (certainly no English), but it hardly matters. The menu is set and there's really only one word that matters. You'll hear it with increasing frequency throughout the night.